The Best Oxygenating Toothpaste - A Dentist's Opinion - Which One? An oxygenating toothpaste is a type of toothpaste that releases oxygen when it is used to brush your teeth and tongue. Why would you want a toothpaste like that? What's the advantage? To combat the bacteria that can cause bad breath. That's the long and the short of it. Simply - an oxygenating toothpaste will help with bad breath. The bacteria that cause bad breath live on the very back of your tongue, almost down your throat. Everybody in the world has these bacteria - they are a normal part of our digestion. They break down proteins in foods. But sometimes they can become over-active, and break down proteins at a higher rate. When this happens, they release gas compounds that cause bad breath. These are called volatile sulphur compounds, or VLCs for short. You can read more about this process at Bad Breath Mouthwash. It's important to remember that these bacteria are not "an infection". They are at the back of everybody's tongue, all the time. Problems only occur when they become over-active. Here's my TOP recommendation for the best products to help you. The first one is TheraBreath Oxygenating Toothpaste, from Amazon. The SECOND one is a TheraBreath Oral Rinse, also from Amazon. Why Use An Oxygenating Toothpaste? The bacteria grow best in low-oxygen conditions. So they can thrive at the back of the tongue where there is very little oxygen. But this is also their weak spot. They don't do well if there is much oxygen around. In fact, they HATE oxygen. If we can get some oxygen to the back of the tongue, it really slows the VLC - producing bacteria down. And that means they breed more slowly and break down proteins more slowly, and so produce less of the bad-breath causing VLC compounds! It's not easy to get oxygen to the back of your tongue - remember, these bacteria live halfway down your throat. AND, some chemicals in normal toothpastes and mouthwashes can interfere with the oxygenation process. For example, if you are trying to use an oxygenating mouthwash, you must also use a matching oxygen-releasing toothpaste. Because most normal toothpastes contain Sodium Lauryl Sulfate, which will inactivate the oxygen-releasing process! So you need to use matching products, if you want this whole oxygenating thing to work! In my experience, I think the best ones are from TheraBreath. According to the manufacturer, "all the ingredients used in TheraBreath products include the oxygenating molecule Oxyd-8, tea tree oil, zinc gluconate, essential mint oils, xylitol, CoQ10, and aloe vera. TheraBreath products DO NOT contain alcohol, sodium lauryl sulfate, saccharin, benzalkonium chloride, or any artificial colors or flavours." So, if you're looking for an effective oxygenating toothpaste, be sure to use products that won't interfere with each other, such as the TheraBreath line-up! ALSO, Get a GOOD-QUALITY electric toothbrush. 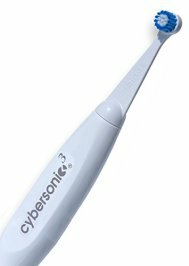 But don't get any electric toothbrush - GET MY TOP-RATED BRUSH, THE CYBERSONIC 3. If you use my special DISCOUNT CODE you can get the Cybersonic3 at around HALF PRICE - that's just $50 !